High School Musical alumni Lucas Grabeel and Drew Seeley and newcomer Adrian Slade star in this musical look at the torment of falling in love when youâre in the middle of becoming a vampire. Dylan (Grabeel) is terrified when a nasty bat bite transforms him into one of the living dead. His world is turned upside down, and he has to figure out how to balance his budding romance with the girl next door and the bloodthirsty desires his magnetic vampire mentor Trey (Seeley) is constantly urging him to give in to. Dylan is crazy about his neighbor Sara but when he starts developing fangs and a thirst for O positive heâs terrified that if he kisses her he wonât be able to stop himself from drinking her blood and draining her dry. This may not be the most creative of storylines (what is anymore) but add in humor and music and you have an entertaining show to download. I will probably download the tracks and will be singing them all day and night. 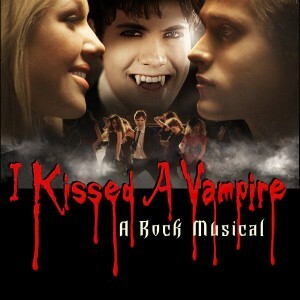 Just wanted to let you know that the second episode of “I Kissed a Vampire” premieres tomorrow (October 20)on iTunes.